The last couple of days have turned Minneapolis into a winter wonderland! While most people are cursing the snow, I’ve been cheering! I love seeing it, walking in it, even driving in it. More snow, more, more, more. When I lived in Colorado, I could drive up into the mountains and count on there being enough snow to snowshoe any time I wanted. But here, you’ve gotta take advantage of it when it snows right away, because if it doesn’t melt, it will most likely turn heavy and sloppy or crusty and weird or just generally less cool. So I decided that, in spite of looming finals, because I finished my GIS project a whole day and a half early (that’s right folks, I said EARLY – it’s the new, improved, Karen 2005, look out! ), I had earned some sn owshoeing. Besides, the dog had to get walked anyway, right? So this morning bright and early Nate and I took Bruno up to this country club a couple of miles away that has a big ole golf course where I’ve gone sledding and where our friends snowshoe with their dog. Ohh, what a way to start a day! The snow was so fresh and deep and perfect! 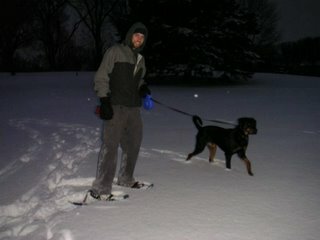 It was our first outdoor adventure with Bruno, and the husky in him (he is TOO a husky Nate!) really showed as he romped around in the snow. It was so fun! YAY WINTER!!! And to add to my winter joy, the ice is primed and we have our first broomball practice on Sunday. This is the Grim Sweeper’s year, I feel it. 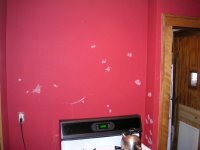 Posted by Nate in Day to Day, Family, Home Improvements. 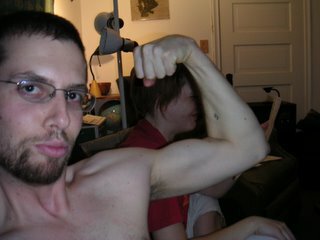 So maybe that’s the point of this blog right now, to be the ballast in an otherwise confusing, hard, and painful world. Because, despite all the bitching we do about finals, work, and house projects, our life is a delicious slice of cake, devoured at our leisure, with all the good and such a tiny sprinkle of the bad it’s like it doesn’t exist. 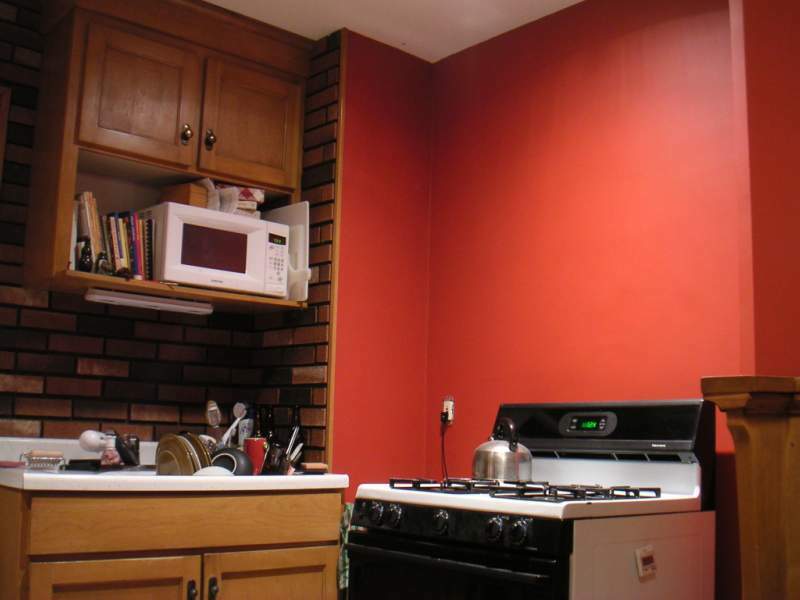 Where do I get off moaning about having to repaint our kitchen??? Still, that’s where things are right now. Maybe it’s our little struggles that help balance out the big ones, and in case it turns into the opposite I’m not going to sit here and wait for it. Luck, fate, or karma, I think the lesson from all those links above is to pay attention and BE in the moment you are in, with the people you love. That’s worth shooting for. SO! On with the petty(ish) posts! 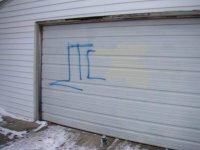 Last night, in the limited time after I’d gotten home from work and Karen got home from her work, we were hit with some gang graffiti on our garage door. On the left is a shot I barely remembered to take halfway through covering it up. 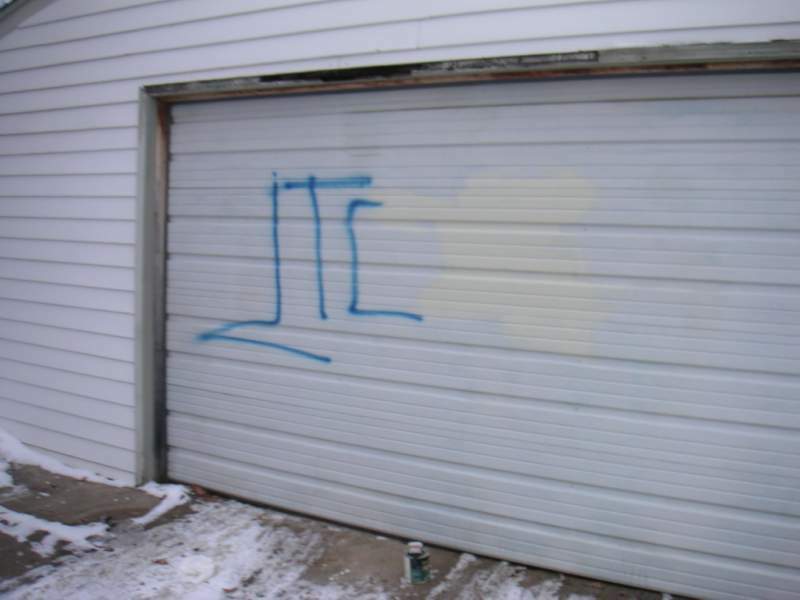 That paint, by the way, came with the house, marked as "garage trim". No, it’s not. So that was frustrating for a minute, but really just a belated "Welcome to Ward 9!" present. Now we’re really residents. Finally, on seeing the red paint in the kitchen, a fellow blogger was heard to remark – "Isn’t that the same color it was?" To which I say, "no." A thousand times, "no." It was sickly orange. 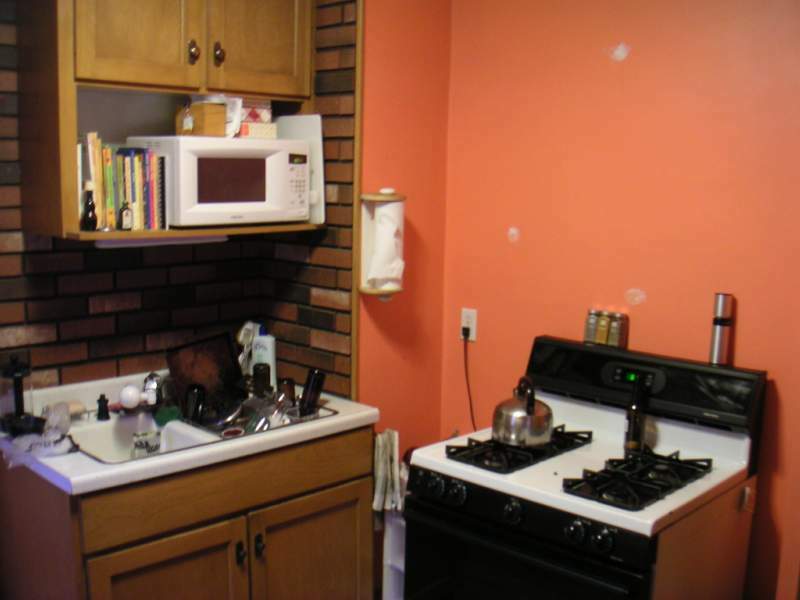 Ok, the orange worked originally, but not with our stuff. Check it out: before (left) and after (right). So. Cool. You all be good and take care of yourselves and each other. I mean it!!! I realized the majority of the Schroeder family was now blogging (if you count travelpod, which I do), and realized there was a neat trick we’re using at work that would mike life easier for us all. If you’re using an aggregator (FeedReader, RSS Owl, or web-based Bloglines, even Google), you can now subscribe to one single combined Schroeder feed! Everything’s in there, new posts will automatically appear, and it’s all in chronological order! Even the travelpod entries! Check it out. It’s really cool. It’s like a combined Schroeder life journal, only better. I think one of the qualities that makes me good at my job (if I do say so myself) is my attention to detail. Often, in programming, there are two ways to solve a problem: 1) a solid, quick, and obvious way that will work well, and 2) an equally solid way that is not nearly as quick but has been thoroughly thought through and (hopefully) addresses all options and variables. Usually both methods will yield favorable results – at least at first. Over time, code written using method 2 will start to outshine method 1 code. As applications evolve and users start pushing them in directions you never intended, the more deliberate code will generally hold up to more abuse, require less maintenance, and perform better. It’s sometimes the case that there’s clearly a right way solve a problem, but I can’t find it, so I keep going down the method 1 path, until suddenly I see the right way. And even though I’m almost done – the code works as it is – I can’t finish it like that. I have to go back and make it right. That may sound weird to non-programmers, but you know what I mean? A lot of people don’t realize there’s a huge creative side to programming, beyond the problem solving and grunt work of simple code. It’s a great feeling, but it can generate lots of extra work. Which leads me to today. I started off with a small brush and some red to touch up the edges that were bugging me, and as I got close to the paint I noticed what looked like a white dust on it. I’d noticed it before but was sure I could just wipe it off, and never paid it much mind. 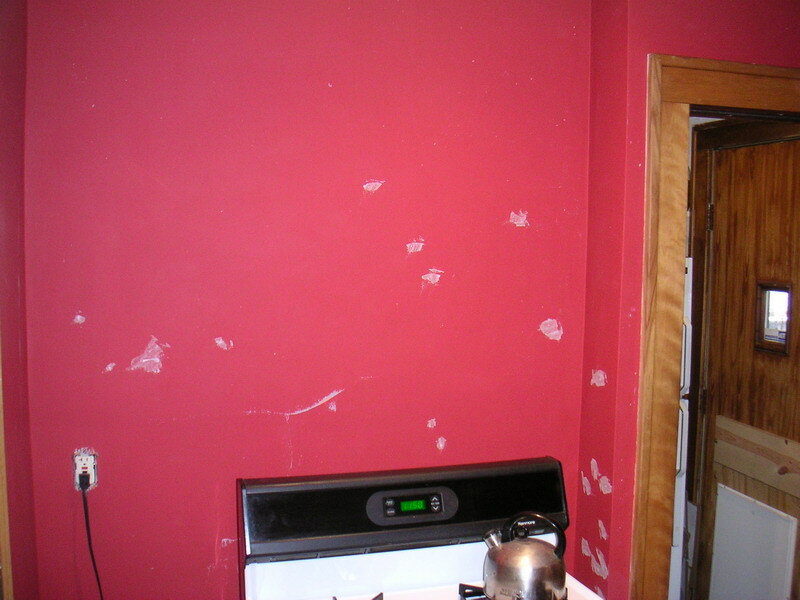 This time, despite good rubbing with a damp washcloth, failed to remove most of the "dust". Looking closer, some of it was reflective, possibly insulation or plaster?? I really don’t know. I didn’t put the recessed light in until at least a week after painting, so I really doubt that was it, but…? Maybe the fan that I had on to help it dry was stirring up some old dust from the first light and skylight?? No idea. But there it was, and now I noticed it I couldn’t stop obsessing over it. A test patch with some fresh paint showed it covered the dust and looked (to me) noticeably better. I read up a bit on Ralph Lauren paints, the reds in particular, and while nobody mentioned flecks of dust, a few people recommended sanding between coats to help it stick properly. (something in the red pigment, I guess) I also took a closer look at a few gouges in the wall I hadn’t noticed until the light was so much better, and a few lumps and bumps that snuck by the first time. And… I decided to do it right. Last night our little boy Bruno graduated from doggy school level 1 at Twin Cities Obedience Training Club. We couldn’t be prouder. It’s actually kind of amazing to think about what he’s all learned in the last 9 weeks. When we first brought Bruno home a mere 2 1/2 months ago, he sort of knew "sit", and he was pretty decent on walks. Now he sits, lays down, stays, stands, shakes, rolls over, heels, and more. Granted, not perfectly every time, but pretty darn close. Last night’s big tests were weaving through cones by leading him with my hand, and heeling down to one side of the ring, doing a u-turn, sitting him, staying him, and then le aving him there, walking down to the other end of the ring, releasing him from the stay and calling him to come to me, and having him sit when he got there. Ohh, he made his parents proud. He will miss his friends Boomer, Brandy, and especially Amelie the pug, but there will be more dog friends in his future. 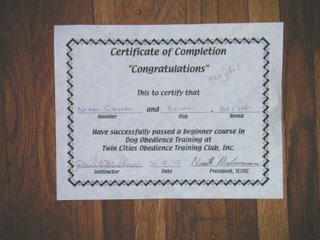 Level 2 will have to wait until after broomball season, but I think Bruno is already well on his way to being the best trained dog in the world that Nate dreams he will be. And speaking of Nate, I’d like to give a little shout-out to him for picking up the at-home training while I’ve been under the weather. Shaking, rolling over, and standing? All Nate. Well, and Bruno I guess. 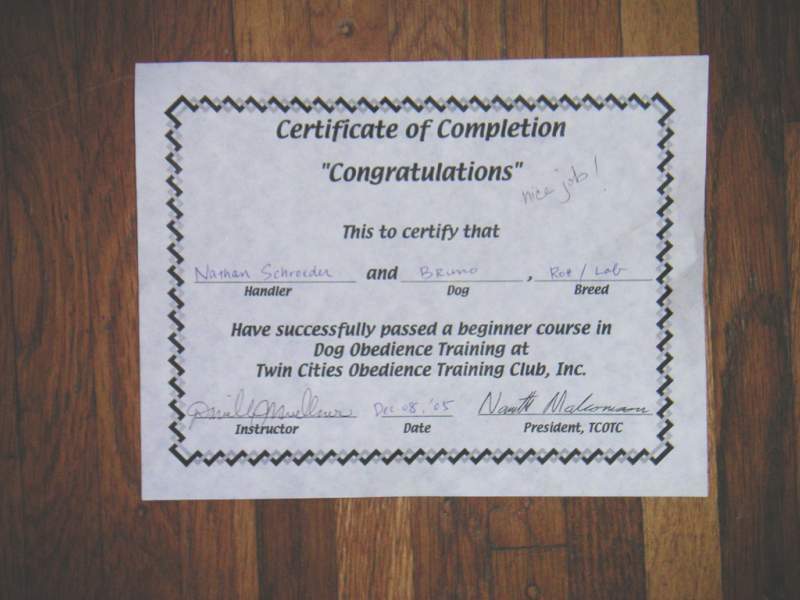 The first picture is the certificate Bruno got for completing Level 1 (it only has Nate’s name on it because he’s the one who registered him for class). 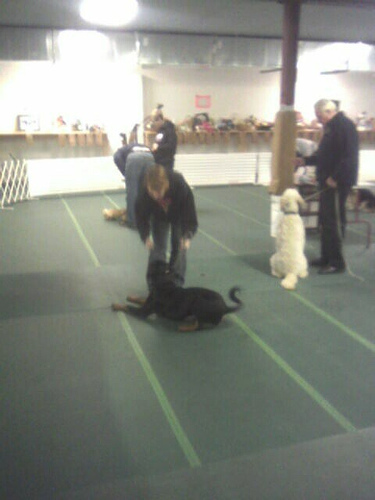 The next one was during one of our training classes a few weeks ago. 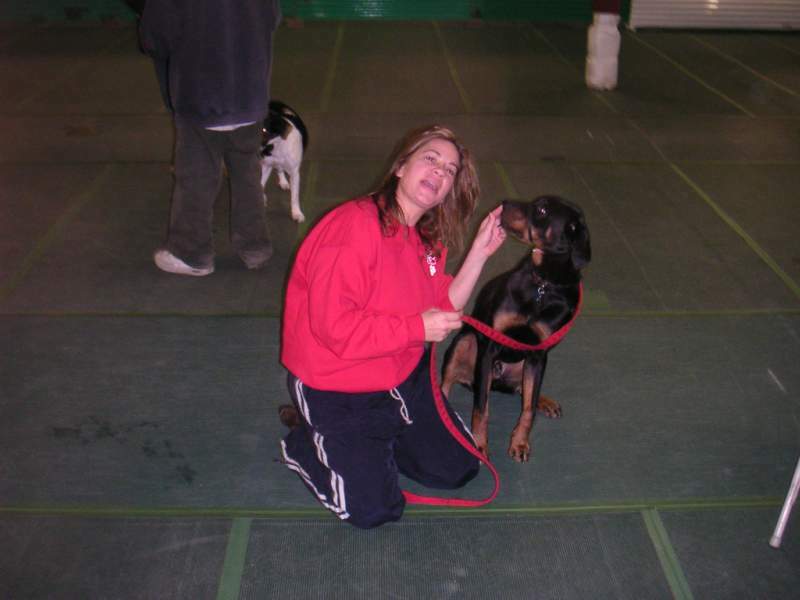 And the last one is Bruno with the best trainer in the world, Dani, the Dog Whisperer. 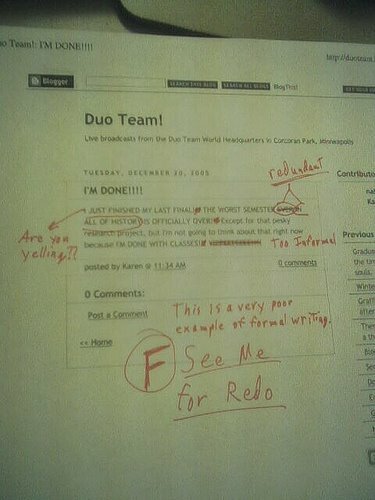 You are currently browsing the Duo Team! weblog archives for December, 2005.